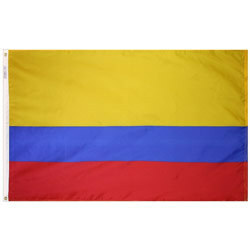 Francisco de Miranda, a Venezuelan revolutionary, created the flag of Gran Columbia, which inspired the Columbian, Ecuadorian, and Venezuelan flags. His use of yellow, blue, and red was motivated by Johann Wolfgang von Goethe’s theory of primary colors. The meaning behind the colors varies but the current interpretation is that yellow represents the gold found in Columbian land, blue represents the seas at Columbian shores, and red represents the blood spilled in pursuit of Columbian freedom.